Announced at the same time as the firm’s new flagship OM-D E-M1 model, this new high-grade wide-angle to short-telephoto zoom is the equivalent to a 24-80mm and boasts a constant f2.8 maximum aperture that will appeal to stills photographers and movie-makers alike. 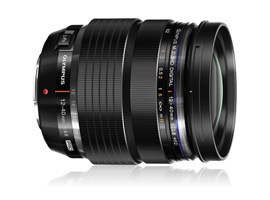 As with other high-grade lenses from Olympus, it has a push/pull focus collar with a declutching mechanism to switch quickly between manual- and auto-focus. Internally, the new lens has a high-speed linear AF motor for fast, near silent autofocusing, a new dust-, drip- and freeze-proof design and a complex optical construction consisting of 14 elements in 8 groups. The optical design sees liberal use of low dispersion and high-refractive index glass types and both single and double sided aspherical elements. Despite the ambitious spec, the lens remains reasonably compact with a 62mm filter thread, measures 84mm in length and weighs just 382g (13.47 oz) in total. The Olympus M. Zuiko Digital ED 12-40mm f/2.8 PRO is available for pre-order at $999. 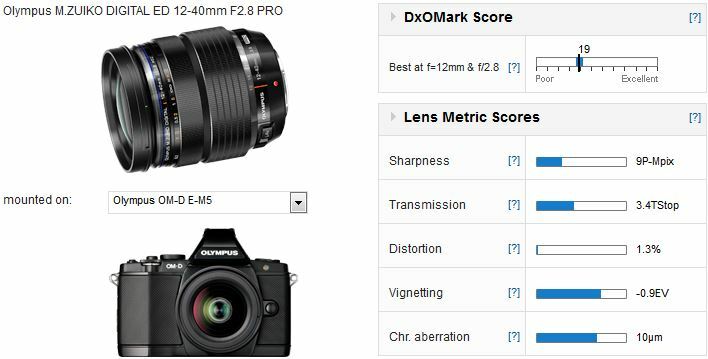 With a DxOMark lens score of 19 points, the new high-grade zoom lens is ranked in joint first place alongside the Panasonic Lumix G X Vario 12-35mm f2.8 ASPH Power OIS, but comes second to that slightly more-pricey model in average sharpness (with a score of 9P-Mpix). Out of the standard zooms, unsurprisingly the new Olympus model is a far superior model but even the more modest lenses perform very well optically. 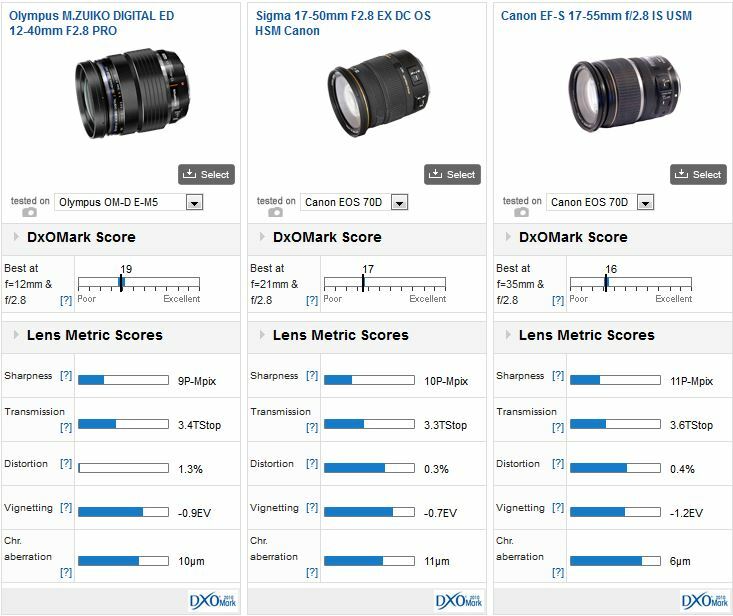 The new M.Zuiko Digital Pro zoom achieves a DxOMark lens score of 19 points on the 16-Mpix OM-D E-M5, putting ahead of every other MFT zoom available with the exception of the Panasonic 12-35mm. It has good overall sharpness, and vignetting and chromatic aberration are both well controlled in a lens like this. 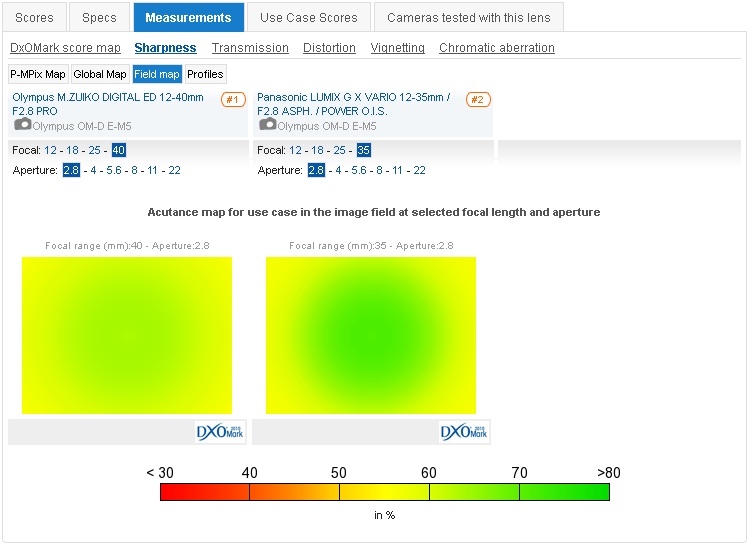 However, distortion is higher than expected over the 12mm to 18mm focal lengths. Compared to its rival, the Panasonic G X Vario 12-35mm f2.8, the Olympus has similar overall optical quality. 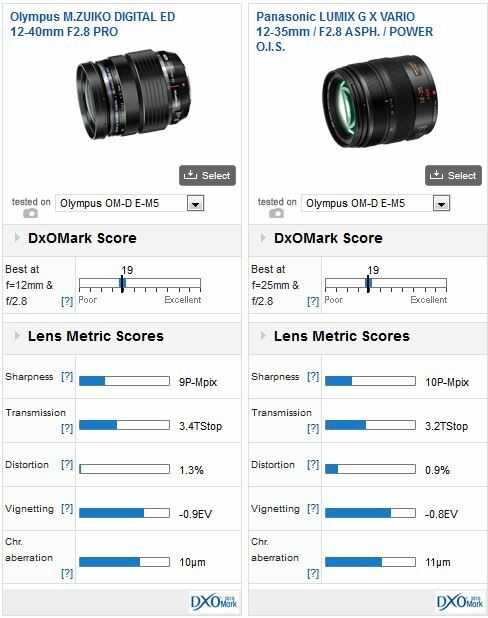 However, where the Panasonic has slightly higher levels of sharpness in the center, certainly at the longer focal lengths, the Olympus has better uniformity across the field at wider apertures, particularly at the shorter focal lengths. At the shorter focal lengths, the Olympus is sharper with better uniformity than the Panasonic, particularly at wider apertures. Uniformity remains good across the field but sharpness falls away at 40mm on the Olympus. If we compare the Olympus with rival constant aperture models designed for cameras with larger cropped sensors, specifically the Sigma 17-50mm and the older Canon EF-S 17-55mm f2.8, we can see that the new 12-40mm is on a par with those models. 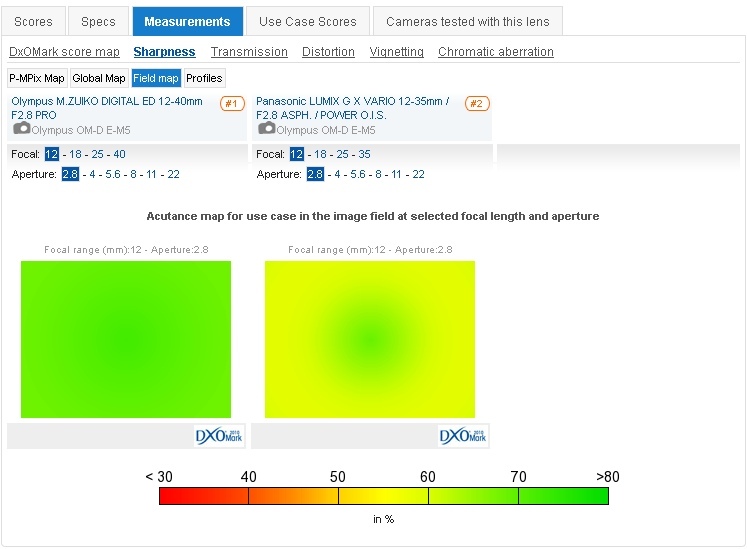 Although sharpness levels are a little lower they are not dis-similar, especially considering the difference in pixel count between the E-M5 and Canon EOS 70D. Distortion is less of an issue with the larger APS-C lens models, but in every other respect the 12-40mm compares favorably. The Olympus M. Zuiko Digital ED 12-40mm f/2.8 PRO is a good lens, very good in fact, easily challenging the optical performance of the rival, and slightly dearer Panasonic model as well as high-grade APS-C lenses. But, at a whisker under $1000, quality like this doesn’t come cheap.